Our comic book has been available in Korea for a few weeks (apparently it’s now considered a best seller too!) but it’s only just now available internationally. If you don’t live in Korea and want to order the book, head over to My Korean Store, the Talk to Me in Korean online store. This comic book is in Korean, with English subtitles’ next to the comics so it can be helpful when learning Korean. If you do live in Korea you can buy from Kyobo book stores, online and offline and it’s available on other online stores Coupang and Aladin. We’ve been away on a trip this week so wasn’t able to put up the link to the new episode but you can check it out here! CLICK HERE FOR FULL EPISODE. This is the next part of mini story within the webtoon about a classic Korean folklore story. Like, share, comment and rate over at WEBTOONS! Thank you everyone who came out on Saturday! It was amazing! We didn’t know how many people would come, especially in the rainy weather, but we were overwhelmed at the turn out. We actually ran out of time, we only had a certain amount of time for the signing at the front of the Kyobo store. For the last few people we had to go inside the store to another room to finish signing and chatting with people. Thank you everyone who wrote us notes as well! We read them all later and were so thankful and happy. The book also made it to the bestsellers of new releases table for this Kyobo store, which is great! It means it’s easier for people to see in the store, and that’s because of everyone who came and bought the book on Saturday. Many people have been asking about an English version, but there won’t be an English version of this book exactly. There are English translations next to the comics, so it can be read by an English speaker but there is still a lot of Korean in it. Most of the comics in the book have previously been on the blog in English. The comics and the set up of the book is for the Korean audience, so if we release an English book it will be a different angle and different comics. But maybe in the future! If you are in Korea and you could like to buy it you can buy from Kyobo book stores or order online here. If you are not in Korea it will soon be available through the ‘Talk to Me in Korean’ online store. We will update when it’s available. Once again a big thank you to everyone who came out to the signing event. It was very overwhelming but awesome! It was also lovely to see so many intercultural couples and families there as well. We hope our book also helps challenge negative perceptions about multiculturalism in Korea and educates people about intercultural families. The footage was filmed by Yoojin Kwon, Hugh’s trainer and business partner and distant relative haha. READ THE FULL EPISODE HERE ON WEBTOONS! The Nicholalala webtoon is an ongoing, mostly fictional, webtoon with elements of Korean folklore. There is always someone weirder than you. That’s way more weird than me just playing with worms and insects! I know people can eat crickets, but do people eat cicadas anywhere? The cicadas in Korea sound slightly different to the ones in Australia. I think they are a higher pitch. I’ve often heard people say they find the ones here in Korea to be more irritating. They will still try to pee on you like the ones in Australia though. I will continue to gross out Hugh with stuff though. He grew up in the countryside! He used to catch frogs and snakes and bugs when he was young! I don’t understand his aversion now. He just says, “It’s different now”. It’s been a long time since he has touched them, but for me it was somewhat recently that I was doing a zoo keeping course that sometimes involves insects, either as exhibits or food for other animals. 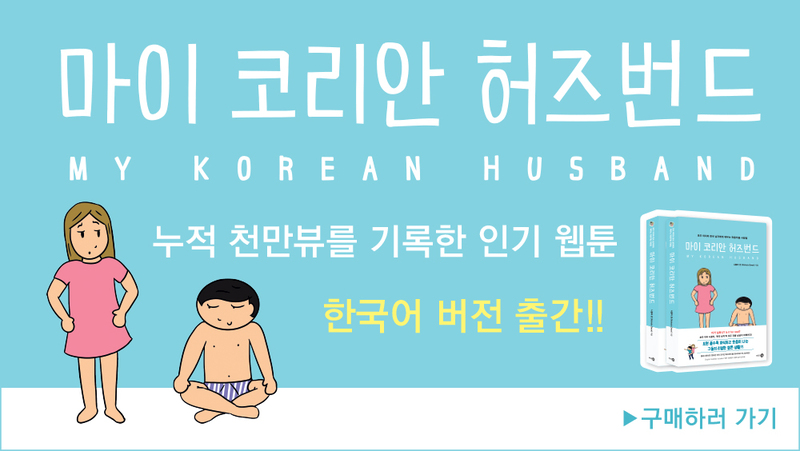 The ‘My Korean’ Husband’ book is available from today! It is available in Kyobo book stores and online here. This books is in Korean, but there are English captions for the comics. It is not yet available internationally yet, as it is for the Korean market, but we will update you when it’s available internationally online. 책 읽어보시고 좋으셨으면 좋은리뷰와 좋아요! 그리고 공유 많이 부탁드려요! READ THE FULL EPISODE HERE! Nicholalala is an ongoing fictional webtoon series on WEBTOONS with elements of fantasy and folklore.